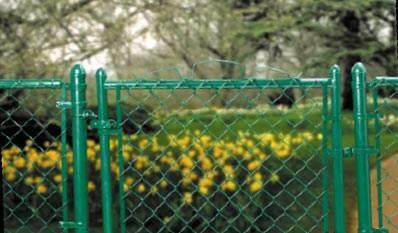 Chain link fence is most commonly available galvanized which is silver in color. We also carry colored chain link fence fabric, framework (posts and rail), colored fence fittings, gates (swing and slide), and gate hardware for all fencing applications from standard residential to light commercial, to heavy commercial and industrial fence applications. Our fence experience ranges from all phases of residential fence construction to the most difficult and specification-based industrial security fencing applications, including professional baseball ball stadiums, stringent nuclear plants, and high security airport fence jobs. We've fenced in buildings, inside of buildings, on roofs, in fresh and saltwater; we've even fenced in lions, tigers, and bears! Our full fabrication shop, experienced staff, wide range of standard and specialty fence parts inventory, and long-standing relationships with top fence manufacturers, makes 5th Generation an ideal supplier for all your fencing needs. With assistance from the 5th Generation Team, all phases of your project will either be handled directly or reviewed by a Certified Fence Professional educated and experienced in fence specifications and quality fence materials. Don't be fooled by inexpensive fence materials sold through big-box stores; these materials are usually not worth the effort to install and will not stand the test of time.